Caracal – Felis Caracal – Is found throughout Africa except for the dense forested areas of the Congo Basin and the Sahara dessert. Other parts of the world that you will find them is the Middle East, Central Asia and India. Although similar in appearance it is not related to the Lynx which is a Northern Hemisphere “snow-dwelling” cat which is heavier and mottled black, white and grey. 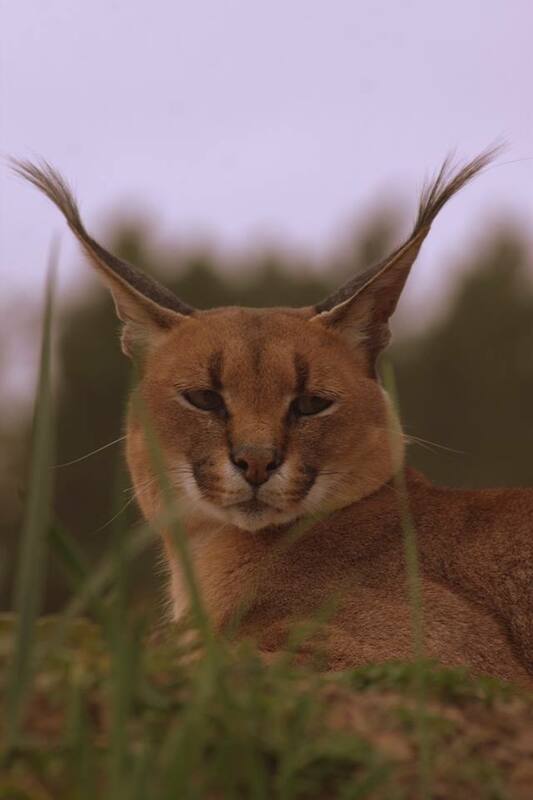 Only the Caracal and the Lynx have tufted ears. The Caracal (Afrikaans nicknamed “Klossie oor” – “Tufted ear” and known in Afrikaans as the “Rooikat” – “Red Cat” is the only cat that hunts at day and at night. It is a cat that specialises in hunting flying birds by jumping upwards vertically and catching a bird in flight. You will notice that they have powerful back legs and a short tail. Considered vermin by livestock farmers who shoot them on sight, they are constantly under attack. Unfortunately, not enough research in alternative farming methods has been done to stop this assault on these magnificent creatures which also add value to farming by in turn preying on rodents, hairs and hyraxes.